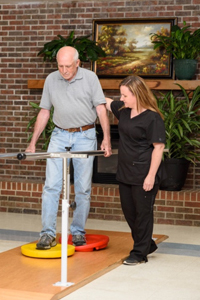 Our gym provides a full range of therapy opportunities; Physical Therapy, Speech Therapy, and Occupational Therapy. Skilled and experienced staff provide specialized medical services required for recovery from surgery or acute illness and transitioning to home. Faster recovery from acute illness, traumatic medical event or an invasive surgery like joint replacement can be facilitated in our gym. Activity of daily living and Restorative Therapy in a home-like setting targets individual needs for recovery.